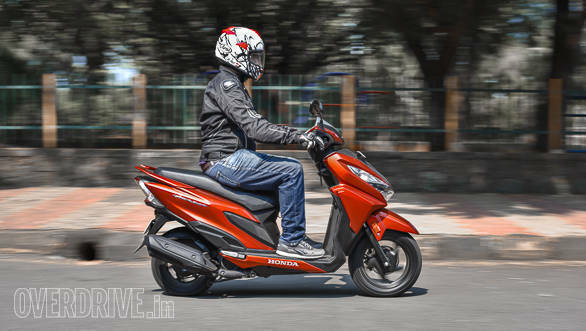 More than one in two (57 per cent) scooters sold in the country is a 110cc Honda Activa 4G. 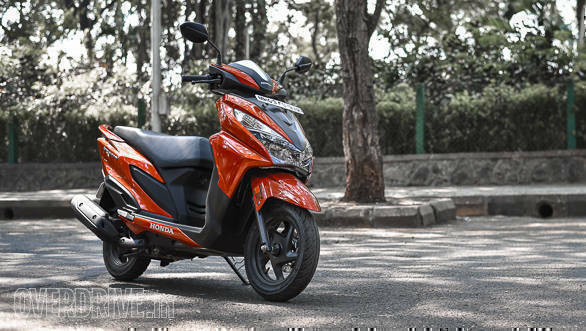 The 110cc category comprises 91 per cent of overall scooter sales in the country, leaving a miniscule 9 per cent for 125cc-plus scooters. And it's not like Honda Two Wheelers India does not have a piece of that small pie either, as it has the Honda Activa 125 on offer too. 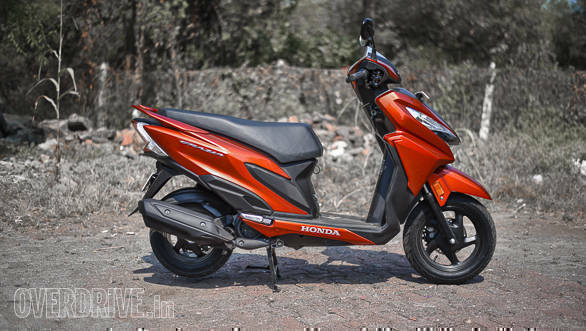 But Honda believes that there is no scooter in the 125cc segment that is designed to appeal to the urban youth and has features to match their needs. Cue the Honda Grazia, its newest flagship scooter which was launched this week in India. 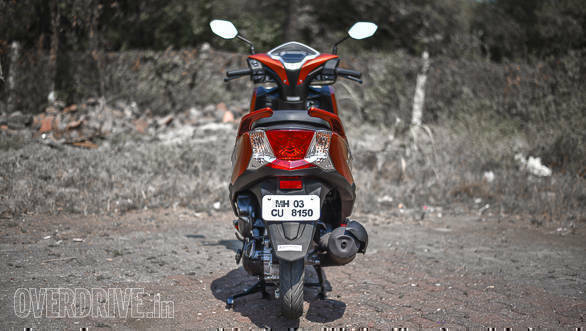 The Honda Grazia easily distinguishes itself from the unadventurous styling of its sibling, the Activa 125, with a muscular look. 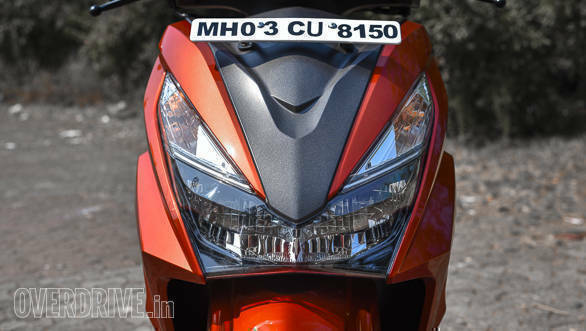 The wide all-LED headlamp with big indicators on both sides takes up a third of the front apron. The lights are surrounded by muscular creased panels and a V-shaped matte black plastic garnish. The cowl housing the instrumentation appears busy with panels in three tones - body colour, matte black and shiny silver. From the sides the Grazia appears to have a shark-nose. Muscular lines continue to the side panels and large 'Honda' lettering stickers are seen under the floorboard. Honda says many of its younger buyers have been adding this as an after-market customisation to its other models. 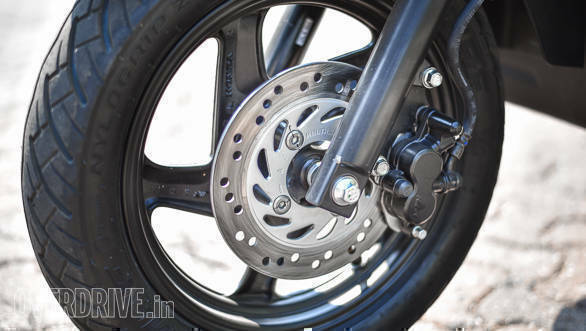 On the top DLX variant, you get black alloys in 12-inch front and 10-inch rear sizes shod with tubeless tyres as well as a 190mm front disc brake. The 3D Grazia logo on the side panels is finished in chrome. Chunky split rear grab handles look great as they appear to be an extension of two lines from the top of the side panels. Foldable aluminium footrests add to the premium feel. The seat trim is faux perforated material and reminded me of perforated leather trim seen in high-end sportscars. The back is not as arresting, but the large tail lamp and integrated indicators should get some attention in traffic, particularly when lit up. The heat shield on the exhaust gets a faux-carbon fibre texture and adds to the sportiness of the design. Overall, the Grazia's design seems aimed at a young audience looking for a premium sporty scooter. And it definitely if shouts, if not screams, to be looked at. Parked outside a college or waiting at a traffic light, the Grazia did bring in some curious stares. 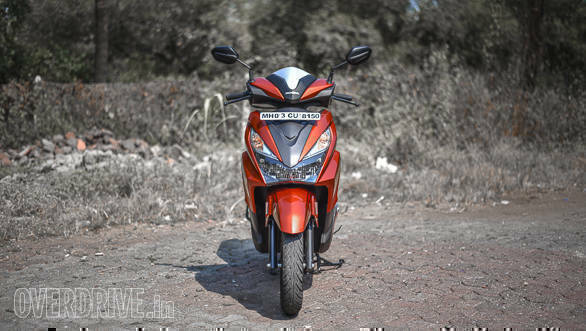 The Honda Grazia comes powered by the same air-coooled, 124.9cc single-cylinder engine as the Honda Activa 125, and produces an identical 8.6 PS at 6,500rpm and 10.54Nm at 5,000rpm here. 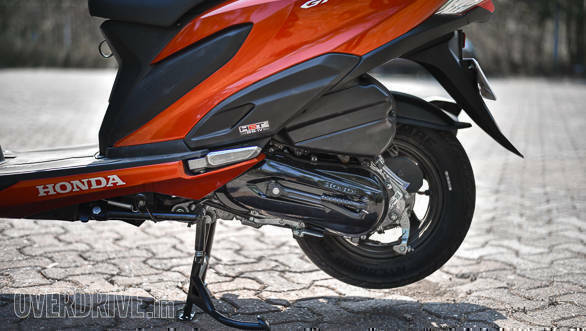 The engine features Honda Eco Technology (HET) which lowers friction for increased efficiency. 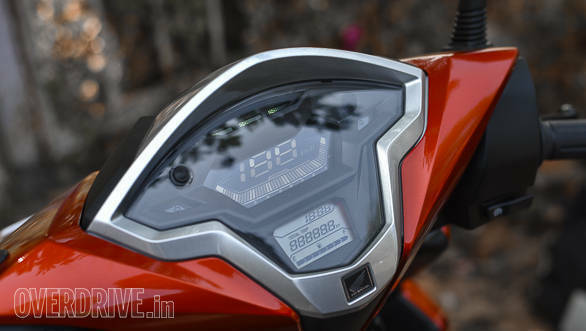 It weighs 1 kg lesser than the Activa 125 at 107kg, and Honda claims the Grazia's top speed is 1kmph higher at 85kmph, while claimed efficiency stands at 50kmpl. This is where the Grazia truly comes into its own. Honda has bestowed it with various features to take the fight to competitors that were better-equipped than the Activa 125. First off, the Grazia has an all-LED headlamp that is as good to look at lit up, at as it is to use. It also receives a fully-digital instrumentation cluster. The speedometer has a blue backlight and also features a tachometer, something I hadn't seen on a scooter before. A smaller second display houses a clock and tripmeter, which can switch between the current trip and total km. Atop the digital cluster are three LED lamps, which are Grazia's three-step eco indicators and light up as you fulfill each mode's criteria. They can be switched off if the lights are a distraction. Switchgear, however, is standard Honda fare. 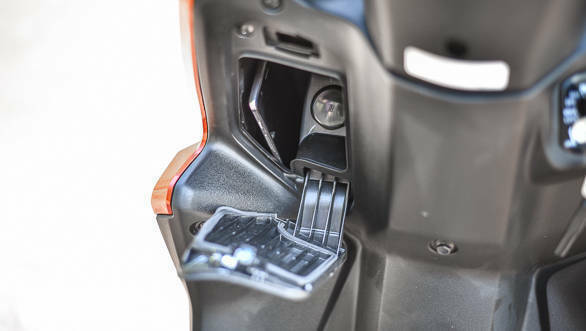 There is a closed compartment on the interior of the front apron to safely store a mobile phone. There is also a ready slot to attach an optional mobile charging socket here. The keyhole too has been reworked. Now to open the seat, you simply turn the key to 'Seat' and then press a soft doorbell-like switch next to the keyhole to unlock it. Underseat storage at 18 litres is good and should fit a medium-sized full-face helmet or a light backpack with ease. The Grazia felt light to move around as I took it off the stand. Acceleration is linear from about 15kmph onwards and continues to be so all the way to a speedo-indicated 80kmph, with some juice left to go further. At traffic stops, it felt easy to pull past most scooters and small bikes with the added power of a 125cc engine. Flicking it about in packed traffic did little to take away any confidence as the Grazia seems to be a tip-happy scooter and the MRF Zapper FG tyres remained fairly grippy over smooth surfaces. Going over small potholes and broken tarmac, the Grazia with its telescopic front forks behaved itself to a large extent. But it seemed less poised and I heard thuds when riding through some larger potholes at speeds around 40-45kmph. However, the combination of the comfortable seat and the soft grips on the handlebars did cut out a lot of the vibration and thuds from reaching me. Braking with the 190mm front disc and 130mm rear drum brake working in tandem via the Combined Braking System (CBS) felt reassuring but would be better if it took a tad shorter to come to a halt. 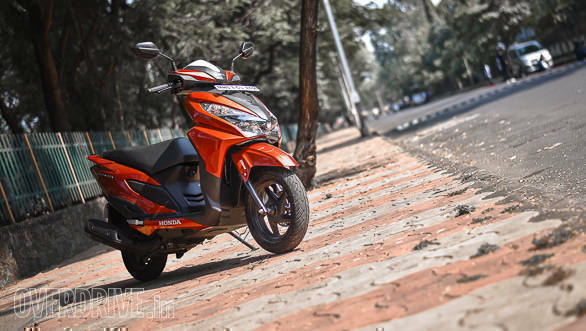 Overall, the Honda Grazia seems to work in busy urban scenarios and I was as comfortable riding it to work in the day, as I was riding it home later in the evening. In fact, the evening ride went smoothly thanks in part to the confidence from the Grazia's LED headlamp. A well-lit path from the wide and consistent beam meant I could plan my movement earlier and hence avoid obstacles and bad surfaces as well as the odd pedestrian running across the road. I even recall remarking to a colleague that maybe I was the only one at the dinner table who did not seem exhausted after a busy day owing to the convenience and adequate performance of this scoot. The Honda Grazia is a fun urban scooter and a breeze to ride. The engine has a rather smooth demeanour which should prove practical over extended commutes. The long list of new features will serve as an attraction for prospective buyers from the young professional/college-goer crowd. Honda Grazia is available with four metallic and two matte paint options in three trims - Standard with drum brakes and steel rims at Rs 57,897, Alloy version with alloy wheels at Rs 59,827 and the top-end DLX variant with front disc brake at Rs 62,269 (all prices ex-showroom, Delhi). Now, whether it matches up to or surpasses the current segment leader, Suzuki Access 125, remains to be seen.